The Empire State is known for New York City, its picturesque upstate pastures, and its historical roots in American culture. 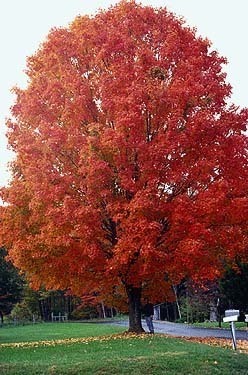 It is fitting, then, that New York residents adopted the Sugar Maple as the state tree in 1956. A native hardwood to northern stretches of the United States and eastern and southern regions of Canada, the Sugar Maple offers bright orange fall foliage and the delicacy maple syrup. A moderately tall deciduous hardwood, the Sugar Maple can reach heights of 115 feet, with round-notched maple leaves and “pinwheel” seeds. The seeds are paired and break off in the autumn, spinning to the ground. The seeds must be exposed to at least 90 days of freezing temperatures in order to soften the exterior for spring germination. Although the Sugar Maple can be sturdy tree for planting, offering both edible investment and valuable shade, New York planters have many other varieties of trees to choose from. Ideal for providing fast-growing privacy, cultivated borders, and effortless growth. 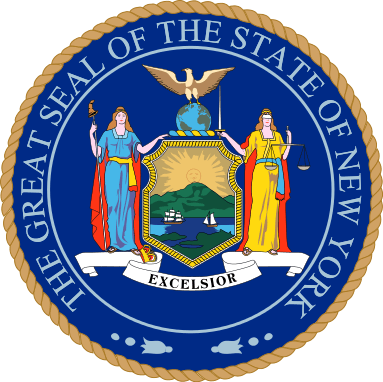 The state of New York is renowned throughout the United States as a comfortable, healthy, and safe state in which to abide. It is no wonder that New York residents may notice new homes being built nearby, new developments and shopping centers popping up, and highways carrying loud cars laid in bulk near their home. Planting trees along yard perimeters will add both privacy and beauty to the New Yorker yard. Although there are many options from which to choose, in New York, a planter cannot be mistook by the American Holly. Growing throughout the United States, American Holly is adaptable, fast-growing, and colorful. Reaching at least 15 feet in height, the American Holly forms dense evergreen walls reminiscent of hedge mazes. In addition, New York residents can also choose from the Leyland Cypress or Nellie Stevens Holly to form the perfect private paradise. 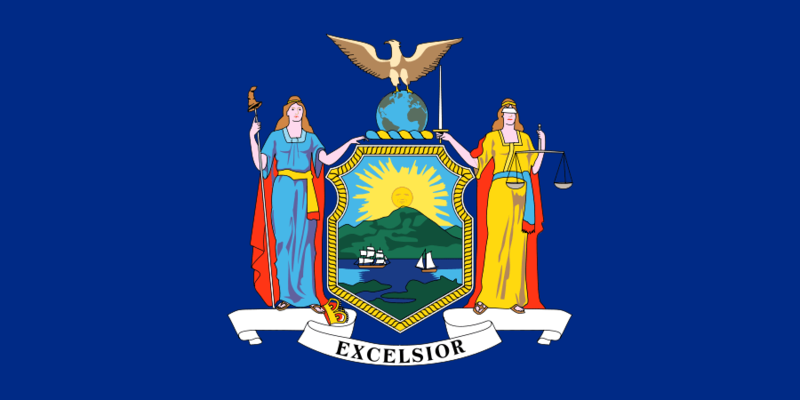 The 27th largest state, New York is the third most-populous in the United States, owning in large part to New York City. The climate of the state is variable, sometimes matching a humid continental climate and sometimes a humid subtropical climate. The annual temperatures and humidity ranges vary based on region. In upstate New York, as well as in the Catskills, Adirondacks, and both northern and southern plateaus, temperatures are cooler. New York City, Long Island, and the lower portions of the Hudson Valley are warmer. Summers throughout the state are moderately mild, with daily averages in the 70s and 80s. Hot, humid days are more frequent in the New York City region, where averages climb into the low 90s. Winters can be quite cold, with temperatures lingering at sub-0°F, though typically they remain in the upper 20s and lower 30s. Most trees require well-drained soil rich with minerals to grow. Honeoye soil covers over half a million acres of New York, and the soil is useful for planting corn, soybeans, wheat, oats, vegetables, alfalfa, grapes, apples, and grasses for grazing. The soil can be slightly acidic, though it is generally quite fertile and neutral in subsoil layers. Regardless of the property’s location in The Empire State, a soon-to-be tree planter can perform a simple test to determine his/her soil type. In order to determine the type of soil in your yard, try this test to give you a basis for finding the best matched trees. For this test, you will need a healthy handful of soil from the layer beneath the topmost piece of soil. The soil should be a little damp, but not recently watered or wet. Simply squeeze the soil sample and one of the following events will occur. 1. You have CLAY if, after opening your hands, the soil maintains its shape, forming a ball. If you touch the sample, it does not fall apart. 2. You have LOAM if, after opening your hands, the soil maintains its shape, forming a ball. If you touch the sample, it falls apart. 3. You have SAND if, after opening your hands, the soil immediately collapses. New York receives plentiful amounts of rainfall, averaging statewide at 60 inches annually. The annual rainfall amounts do not fall consistently throughout the state, with the most precipitation falling in the Appalachian Mountains. The southeaster portion of the state, as well as the borders with Vermont and Ontario, see the least amount of rainfall. Most of the rainfall occurs in the spring, with occasionally summer thunderstorms bringing more. Snowfall can be heavy at times, with Nor’easters bringing heavy wintry precipitation to the region. Regions near the Finger Lakes experience lake-effect snowfall, often gathering upwards of 150 inches. Although rainfall is abundant in New York, irrigation can play an important role in ensuring successful growth for new trees. Newly planted trees are at a greater risk, as the transplantation from the original pot or soil will cause tree stress. Consistent and controlled access to water, especially in the months immediately following the planting, can be the difference between stunted growth and successful leafing. Ensure suitable drip or sprinkler irrigation systems are in place, preferably with indirect contact of the new root ball, prior to planting a new tree. New York is home to eight unique growing zones. A growing zone simply refers to the USDA’s determination of areas where certain plants are most likely to thrive, preferring to focus on minimal temperature ranges in which a plant can survive. Long Island and New York City are the warmest regions, and temperatures often do not linger below -5°F. Temperatures are colder and more complex in northern regions of the state, where varying effects from mountains, lakes, and wind systems are a large factor. Central and eastern portions of the state can be cold, with temperatures dropping to -25°F for extended periods. In the west, near Rochester and Buffalo, temperatures are slightly warmer, lying in the -10°F to -20°F range. In the northern portions of the state, between Utica and Potsdam, temperatures are coldest, staying at -35°F for extended periods. Hurricanes, tornadoes, and flooding are the most common concerns in New York. The state receives on average ten tornadoes a year, with a severe tornado every five years. Hurricanes hit approximately every 18 years, with the distance between severe hurricanes as large as 72 years. Flooding is more common, and it can be especially severe in New York City. If you prefer to purchase your trees or shrubs in person instead of online, we offer this comprehensive guide to purchasing a tree at your local New York nursery or garden center. However, since we don’t actually live in New York we can’t guarantee this list to be 100% accurate – but we did attempt to be as accurate as we possibly could. We have no affiliation with any of the businesses listed below and make no guarantees as to the businesses’ ability or the quality of trees you will receive. As with any purchase you make, be sure to check out the business with the Better Business Bureau, references, and any other sources you may have. Francis Lewis Boulevard. & 46th Avenue.